Vancouver has the fastest-growing residential downtown in North America: nearly 40,000 people have moved downtown in the last 15 years. Nowhere is this urban renaissance more apparent than in the densely packed high-rise condos and converted warehouses of Yaletown. Once an industrial district, today Yaletown is one of Vancouver’s hottest neighbourhoods. It’s home to many of the city’s trendiest restaurants, bars and night spots, hip shopping boutiques, and celebrity haunts. 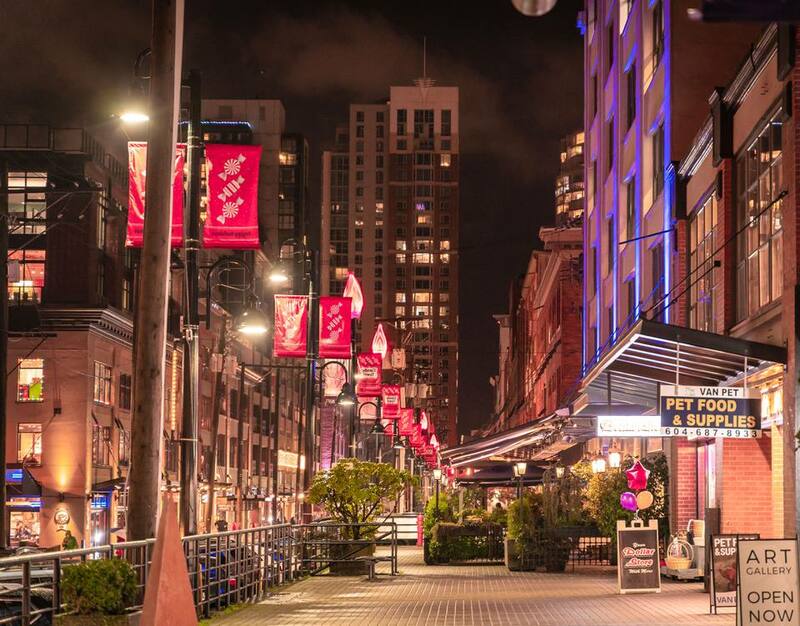 Yaletown is situated in the southeastern portion of Downtown, bordered by Homer St. to the west, Beatty St. to the east, Smithe St. to the north and Drake St. to the south. While the majority of Yaletown residents are young professionals between 20 and 40, wealthy penthouse dwellers, a small number of families, and a growing number of empty-nesters factor into the mix. Whoever they are, there are certain traits all Yaletown locals share: they love their gyms, their yoga, their weekends in Whistler, their easy access to the area’s gourmet food and hip nightlife, and their dogs. Little dogs are de rigueur. To see the locals in action, head over to the neighbourhood’s favorite gourmet market, Urban Fare--Yaletown’s daytime hub--where you can eat breakfast and lunch or bring home dinner. Hamilton Street and Mainland Street are two of the busiest streets for nightlife in Vancouver. Both streets have a collection of bars and restaurants--including Cactus Club, Bar None Nightclub, and the bar at the Opus Hotel (one of the Top 10 Hotels in Vancouver)--that makes bar-hopping easy. If one spot's too crowded--and these places get very crowded on weekends--just try next door. Superb Yaletown restaurants include Blue Water Café + Raw Bar and Glowbal Grill and Satay Bar. There are two parks inside Yaletown's borders, Cooper's Park, at Marinaside Crescent and Nelson Street, and Helmcken Park, at Pacific Boulevard and Helmcken Street. Cooper's Park is a grassy stretch near the Cambie Bridge, perfect for southern city views and for walking your dog, little or otherwise. Yaletown's most significant historic landmark is the famous Roundhouse Community Centre, once the western terminus of the Canadian Pacific Railway (CPR) and a provincial heritage site. It still houses Engine 374, the first passenger train to enter Vancouver on May 23, 1887. (Yaletown is named for the CPR's move to the area from Yale, in the Fraser River Canyon.) Today, the Roundhouse is a vibrant community centre dedicated to arts and learning. Other neighbourhood attractions include BC Place Stadium, home of the Vancouver Canucks, the Queen Elizabeth Theatre, and the Vancouver Art Gallery.